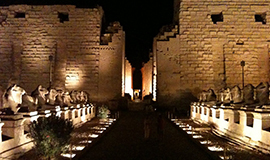 Sound & Light Show at the Karnak Temple. Schedule varies daily. Duration:1 hour. Head back after dark for a totally unique experience as the voices of Egypt's Pharoahs' thunder through the Temple bringing ancient Egypt back to life. Atmospheric colourful illuminations light up it's columns, hieroglyphics and statues making this evening an incredible experience.